Lock in a great price for Hotel Jungfraublick – rated 8.7 by recent guests! Rooms were a little larger than comparably priced hotels in Wengen. Little balcony was nice to relax on while we unwound from our fun day of skiing. The staff are all wonderful, and very attentive. You can tell that they want you to enjoy the hotel. The hotel is very well run, and the rooms on the south side have an amazing view of the mountains, since the hotel is a little bit up on a hill. We had a very enjoyable and pleasant time. This place is a dream, the views are amazing. I cent wait to go back. Everything else about the hotel was nice. Only gave bad reviews on everything else to flag the fire safety problem. We've enjoyed the sunsets in the balcony with an exquisite mountain view! Good location, we've walked from the train station with luggage. Staff was very nice and friendly! Good breakfast. Great location with a lovely mountain view. Good breakfast and super friendly staff. Would definitely recommend! From the minute we contacted them from the train station, Victor was welcoming and the entire staff went above and beyond to make our stay amazing. The bed was so comfortable. The room was perfect. Ahmed at the desk was lovely and knows 5 star service, Eva and Kristin were so sweet every morning serving us our coffees. Great view, clean and wonderful staff. Great breakfast. All the way around a wonderful place. They even gave me ice for my ankles that were having issues. Highly recommend. Hotel Jungfraublick This rating is a reflection of how the property compares to the industry standard when it comes to price, facilities and services available. It's based on a self-evaluation by the property. Use this rating to help choose your stay! 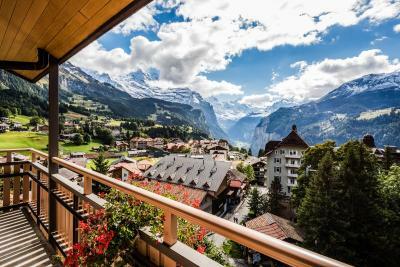 One of our top picks in Wengen.The Hotel Jungfraublick enjoys a quiet, slightly elevated hillside location at 5 feet above sea level in the car-free Wengen, at the heart of the Jungfrau region and only a 5-minute walk from the Männlichen cable car station. The in-house restaurant is only open to hotel guests and serves a rich buffet breakfast every morning. In the evenings you can enjoy a set menu. The rooms with balcony offer a magnificent panoramic view of the Jungfrau mountain and the Lauterbrunnen valley. Hotel Jungfraublick is a 10-minute walk away from the train station in Wengen. Upon request, a pick up and luggage transport from there can be arranged for an extra charge. When would you like to stay at Hotel Jungfraublick? Containing a balcony with views of the Jungfrau Mountain. Equipped with a smart TV and safety deposit box. The private bathroom is provided with a hairdryer. Please note that the photos are examples, the rooms might differ slightly due to the architecture of the building. Equipped with a smart TV and safety deposit box. The private bathroom is provided with a hairdryer. This double room features a seating area, satellite TV and private entrance. Our hotel is situated above the village center and it does not matter if you are located on the first, second or third floor. Jungfraublick is guaranteed, given that the weather is nice! House Rules Hotel Jungfraublick takes special requests – add in the next step! Hotel Jungfraublick accepts these cards and reserves the right to temporarily hold an amount prior to arrival. Please note that Wengen is a car-free village. You can reach Wengen only by train. Park your car at Lauterbrunnen Station and take the train to Wengen. The train ride to Wengen takes approximately 20 minutes. Reservations for parking spaces are only possible for at least 7 days. The front desk is open until 22:00. If you arrive after 20:00, please inform the hotel and provide your cell phone number. The porter is available until 20:30 to pick you up from the station for a surcharge - otherwise you have to take a taxi. Since meals are only served until 20.30 please note that guests arriving after this time will only benefit from bed and breakfast for the first night. When booking 5 rooms or more, different policies and additional supplements may apply. After you book, the property will contact you with more details. The hotel located at hilly area, and we carried our luggage and climbed up at -10 weather. Good exercise for us. We didn't ready for it. It will be better if there's a van ready at the train station. We didn't know that we can inform and let them know our arrival time. Nice breakfast with served coffee and tea. Enjoyed our morning time at your restaurant. A beautiful amazing view. Extremely gorgeous! We played chess games at the lobby with hot coffee throughout a night. Towels could have been thicker. The dining room wasn't able to accommodate us for old year's dinner. Breakfast was a bit scrappy - I think the kitchen is a little understaffed and unable to keep up with the demand for bacon and eggs. Warm inside - Johnny the director was a great host. The lady in charge of the dining room was so helpful and pleasant - a really wonderful person. They lock the main entrance to the hotel from the inside and it requires a key to get out. I did not know or expect this. They also do not inform their guests that this is the case so I did not bring my room key with me when we were leaving. Your room also locks from the inside via key but this not as big of a problem because you can just lock your room door from the inside and leave the key in the lock to let yourself out. We were needing to catch the 5:12 AM first train down to Lauterbrunnen. We could not get out of the hotel! I had to go back up to my room to get my key assuming it would work. I tried it in the main door both directions several times. It would turn but the door would not open. There was a phone at the front desk. I tried dialing zero and 450, which was posted on the phone. No answer. I loudly rang the bell several times. Other hotel exits were not obvious so we couldn't try them even if we could find them. We tried for over 10 minutes to unlock the door, use the phone and ring the desk bell obnoxiously loud. No hotel response. The only reason we were able to get out and catch our train was because some other folks came down and their key worked. This was extremely annoying, we could have missed our train but much worse we were trapped in the hotel! I mean come on. Wengen is a tiny village perched over 4000 feet up in the Alps and doesn't even allow vehicles with internal combustion engines to drive around in town. I'm sure the crime rate is extremely low and probably only slightly higher than the rate of inadvertent fires started in buildings. An extremely simple remedy to solve both problems is to have a door that only locks from the outside and easily opens at any time from the inside. This keeps the Boogeyman locked out and gives the hundred plus people staying in the hotel a fighting chance at getting out before dying from smoke inhalation and Fire.